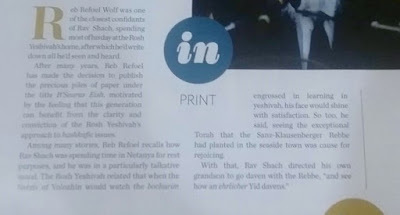 Circus Tent - הירשל ציג'ס בלאג: So why is Mishpacha Magazine touting a book that some stores in Monsey won't carry? I hope you will excuse me in my old age I lost the gist of it.. but I remember that when I started reading it my Radar locked in on "your side" but than I scrolled down seeing there is more to the story.. so I had an option to start over and consecrate better, but maybe I'll loose it again, so I decided against it, therfore I guess you can say that l'man h'uemes, that the best I can say on this kerfuffle is, No Comment. Private conversations, based on the details of the questioner, are hardly a shita to learm from. Yes, he did not think much of the Chabad movement. But these questions asked were asked by private people in their situation. This should not have been published precisely for that reason. Btw, if you want hate, read the letters at the beginning of קונטרס עץ החיים. Pumpkin head, why you made me read than this fools ramble ? shot up for a change. If the godols opinion differences from his private opinion, I would say than that that his opinion is; "I do not want my private opinion to be published" other wise "my" opinion which nulls each other are irrelevant. it also shows that he was clever enough to evaluate the issue thoroughly, and decided my true "public" opinion is what's relevant. I think you are missing information on the fight between Grylak and Grossman. It is personal and business related, nothing to do with 'the straight and narrow'. so now its Mishpaca yesterday Ami, what's next Der something?..or skvere?. can't you see something good on hidden? Tipesh, I'm not sarcastic c"v just curious, is this your given name at birth? or at some given time you became ill and this was your added name for a speedy recovery? "Btw, if you want hate, read the letters at the beginning of קונטרס עץ החיים." shmele zuk "Yiden" mit a yidele..
lutvak on lutvak I'm out of this show, want my refund, hope my zip code isn't on the banned refund list, which these SOB's where doing their most business in these zio code areas saturated with "dressed" kids! talk about cutzpah!!! Not that my opinion is relevant still everyone has one, this is mine, SR was a staunchly anti-chabad of late as anyone right? Still he wouldn't criticise him openly or none disguised in a "lecture". And he didn't want to hear people critical of him.., fact. he non-aporovingly approved of many of his endeavors, he even financialy supported at times his mosdos hatorah, and they'd not so hidden interactions.. on many many occasion, i.e. mikvas worldwide, Russian Jews, Argentina Jews, protests.., and inter-messages to Israeli ministers!, and more. There is no one today who can ostracise a whole struggling community from whit in and out! BTW try to focus the rage inward a little it may help more. There turning nationalist is of great concern to some, and does great damage, and to others a political foot ball, in part because everyone is a lubavitcher no matter what he does or says.., but there is no Lubavitche. I mean there sure is a headquarters alright. Yes I was influenced by this straight forward (tape) opinion, not in the arguments, but in their stirring up old long fadeded flair ups between lutvaks and others, and now it's being used politically. chabad to succeed must stop injecting their rebbe between each of the 10 commandments.. but what's left without the rebbe ! That's what I think is the question. lho'ir, that what he said about marrying a shiktze is against a bfeirushe rambam! Hirshel, granted many of these quotes, if they are accurate, don't represent RS at his best. 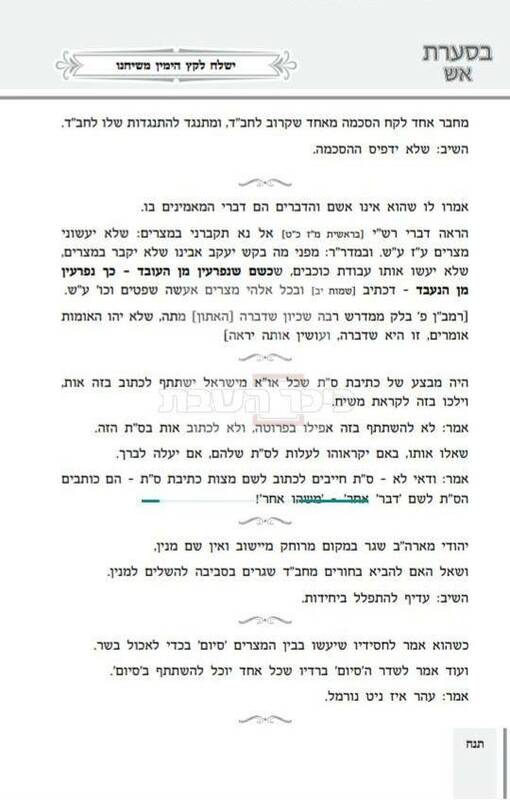 And you have a right to vent after reading such remarks about your rebbe. But it does in a way bring out a point which I have not seen addressed in this blog. Your blog highlights much good points about Lubavitch, and the lack of recognition and respect Lubavitch gets from other groups. But the elephant in the room is Lubavitch's Moshiach problem. Even the most open minded and objective observer can have trouble getting around that, and frankly credit RS for recognizing it early on. Perhaps for another day when heads are clearer. But is that something you can take on? "אחד שרצה להקים בית ספר לרפואה עבור בני חו"ל חילוניים כדי שלא ילמדו עם גויים ויש בזה תועלת שלא ינשאו לגויים. השיב: שאין עניין להשתדל שלא ינשאו לגוים - ובמקום זה ינשאו ליהודיה בחיוב כרת, שלא ישמרו טהרת המשפחה". Which got me thinking: You think the Brisker Rov, who supposedly so held of this man, would act that way in Brest-Litovsk? When some couple who wouldn't probably keep Taharas HaMishpocha would come to him to get married, would he tell them not to get married because they'll get כרת? Or would he marry them knowing full well how they'll live?" The two cases are different. To go, at great expense, to make a special medical school, because it may, possibly, efsher, efsher, years later, help avert something (which is not guaranteed, it may not help), is different than actively refusing people who request siddur kidushin. When will it be Der Veker? Then this blog will have 'made it'. Right, that 'old' hatemonger. The Chazon Ish never really got too oldb and he took hakhel very seriously. Seriously לאיסור that is. But he was also wrong, because he should have known that the generation is getting a נשיא who will disagree and how dare je disagree with the future נשיא הדור? He doesn't say lacks yiras shomayim, he says lacks hair. The tipshus is astounding. 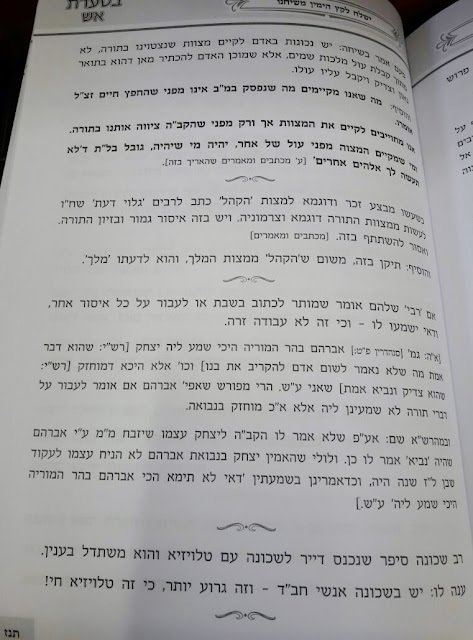 I guess any litvisher bochur who ever did a Mitzva lekabel schar is an oved avoda zarah and nothing became of his mitzvah and others should not be mishtatef in the performance of his mitzvos! CH"V.
Right, that 'old' hatemonger. The Chazon Ish never really got too old and he took hakhel very seriously. Seriously לאיסור that is." "The two cases are different. To go, at great expense, to make a special medical school, because it may, possibly, efsher, efsher, years later, help avert something (which is not guaranteed, it may not help), is different than actively refusing people who request siddur kidushin." Let's see if you can work out the difference. It's not that hard. You should manage. I looked up that page and there is no such note. Can you be more precise if it does exist there????? האמת צריכה להאמר בדוק ומנוסה מה שכתב רבינו בעל התניא קדישא "המתאבק עם מנוול מתנבל גם כן"
Joe's don't kid yourselve you're a pretty decent Munival even before you opened "The Internet" In fact you didn't found just randomly some Munival, You're on the internet precisely for that reason to find a Munival greater than yourself, keep looking don't give up until you will find what you're looking for, yourself. Indeed as others have pointed out, even if he would marry such a couple, the cases are not similar at all:If you have someone coming to you already requesting a marriage, maybe you do not decline them, however to be mishtadel to try and set them up?? And the same ban applies to: "pashkivilin" kipshuto..
Its a miracle he got that close..
"Private conversations, based on the details of the questioner, are hardly a shita to learn from." It all comes down to the following: REMMS was a "ge'vor'ne Yeshiva Mann not a g'bor'ene, so he had lots to prove, by kitz'oniy'us. BTW, Tzig, you're on dangerous ground here, there's not much daylight between you and Shaulson on this one. Topics: Socialism -- Periodicals. Sociology -- Periodicals. In all kunteriesiem of the 90 percenters you see the move to get away from it. Wolf will maybe sell some books, since controversy sells, but Marans image he maligned. Lots of yidelech that were carried away with his hate laced demagoguery are seeing the light. What gave him right to create such a split in Jewry? Lubavicher rebbes view of doing missionary work in the yeshiva world does not give no one the right to claim he is a Kofer???? I see no scandal here, They already showed their true colors when they condemned the Lubavitcher refuges in Shanghai to extinction because someone decided that all "lutvaks" are Talmudist by birth, and all "chasidim" are by definition am-haretzim! therefore they may all perish, Is it any wonder the SHAHc their for bearer condemns them and ostracise them in absentee. (for not sleeping in the succah, yea right) and for his own personal vendata.. common guys it's all dung. why would this smear article be different than any Joe blow blogger, or there comments, just because it is print so someone will read this crap on shabbos!? does that make it more relevant? These guys can print a book full of hate and garbage ועוברים על בל תשחית הדיו והעצים, ולפני עיוור, לא תשנא את אחיך, but if you G-d forbid call them out on it, you're the kitzoni! The Alter Rebbe did his best to make sure that there was no negative response from his Chassidim to Misnagdic opposition. His son, the Mitteler Rebbe, made the divide even greater. He told his Chassidim to avoid dealing with Misnagdim at all. Don't daven in their shuls, etc. The Tzemach Tzedek and R' Itzhele Volozhiner had a close relationship. Together they worked to prevent the government from forcing secular education on orthodox Jewry. Q. It is known that the Vilna Gaon put 2 sectors of Chassidus in Cherem. I am wondering who has permitted them now seeing as we non-Chassidim don't make borders between them and ourselves. A. I heard personally from Rav Moshe Heineman, Rav of Agudath Israel Baltimore and close talmid to Rav Ahron Kotler, that one summer a student asked Rav Ahron this question. Rav Ahron answered that "the whole reason the cherem was put out against the Chassidim was because they didn't learn Gemara, but nowadays (then in the late 1950's) some of them know how to learn better than us!" A Lutvaks "logic" in a NutShell ! My friend told me that after I eat I piece of bread I must say Birkat Amazon. Answer: say your Birkat Amazon with intense kavana. Thank you, A "stock holder". Answer: This has nothing to do with amazon.com, and in fact the "prayer" predates the Internet. (and "succoth"..). Nor with [the fat from] sheeps' tails!, nor with Nachum's fat! The Mishna in Shabbos, you are not allowed to use Nachum's fat for Shabbos candles, one may not light Shabbos candles with oil set for burning [consecrated oil that has become impure], nor with [the fat from] sheeps' tails!, nor with Nachum's fat! What's wrong with Nachum's fat? And then we had Nachum. Nachum was in a class of his own -- he didn't care whether he was in Egypt or not (which was not sufficient to kill him during this plague). But his really big sin was his sale of tallow candles to the Egyptians during the Plague of Darkness. We are forbidden to use Nachum's candles for Shabbos because of the aid he provided to the enemy with those candles. And We have no idea what Nachum puts in his fat, as he would always continue grabbing ingredients, saying, "let's add this too!" He was so well known for this that they even began calling him "Nachum Ish Gam Zu," Nachum the "this too" guy. Plagiarized, Homogenized, and Gentrified L'kuvod Purim. Circus Purim Rav. don't bash the bashers, they bashed themselves alright, by making mockery of their own A-politically appointed rabble rouser Rabbi . Making a siyum on the radio is normal?? Kapoteh, Bekishe, or Sirtuk that's the Question. Why did Lubavitcher adopt the hat and kapoteh (hair/payos) garb similar to the "beloved" lutvaks, and not the distinguished shtrimel/spodik bekeshe & socks variety of the chasidim. Mr. Blogmeister, A lie of omission is a lie in which someone deliberately withholds pertinent details about something in order to skew someone else's idea of the truth or engender a misconception. making mixed conventions us that normal?
" It is known that the Vilna Gaon put 2 sectors of Chassidus in Cherem." and how about what the Nushmas Chaim writes? "the whole reason the cherem was put out against the Chassidim was because they didn't learn Gemara, but nowadays (then in the late 1950's) some of them know how to learn better than us!" Narishkeit, revisionist history. There were multiple reasons for cherem. Yiddishkeit is more than just learning gemara. "להתפלל בבית הכנסת של החסידים אין שום חשש בזה, וגזירת רבינו הגר"א ז"ל לא הי' אלא בזמנו שהקילו אז בכבוד תלמידי חכמים לומדי תורה, ולא כן בימינו שהחסידים חולקים כבוד לכל לומדי תורה והם יראי ה' ושומרים תורה ומצוה. -נשמת חיים, ברלין"
Also not true. There are various reasons not to daven with Chasidim, for example, they changed the nusach, not to get too close to them, שמא ילמוד ממעשיהם, some daven after zeman, etc. "Making a siyum on the radio is normal?? לימוד התלמוד מתחלק לשני חלקים - 'עיונא' ו'גירסא'. בלימוד 'עיונא' לומדים לעומק הסוגיה וההספק הוא איטי יחסית. בזמן המוקדש ללימוד ה'גירסא' הלימוד הוא שטחי יותר, אך השאיפה היא לרכוש ידע כללי במסכתות רבות ככל האפשר של התלמוד. בעקבות הכרזתו של הרבי מנחם מנדל שניאורסון על מבצע תורה מתקיים מבצע מיוחד בישיבות רבות ללמוד ולהיבחן על כל תוכנה של המסכת העיקרית הנלמדת באותה שנה. PS: at that year Torah V'dath/Mir yeshivah had still base ball teams here in NY with real live cheerleaders! and the Aguda of America weren't into "Shach spiels" either.!!! PS: at that year Torah V'dath/Mir yeshivah had still base ball teams here in NY with real live cheerleaders!" There wasn't even a Mir Yeshiva in USA then. And your other info is wrong too. Go sell your fake history elsewhere. "Tzig, You just don't get it . There was no Bnai Tore community in the US until the late 1960's for Rav Aaron to lead. When he died there were at most 150 yungeleit in Lakewood. Perhaps half that amount in Monsey and VeSu lo. The Yeshiva Basketball league consisting of Chaim Berlin, Tore VeDa'as. MTA, Flatbush, and HILI etc. played in a league that included at least 1 team with females - yes live girls- acting as cheerleaders ! Zeire Aguda Israel sponsored "mixed" activities. Exactly what "Bnai Tore" are you speaking of, the ones who went to College at night, or is the ones who dated real live girls ? Who ever heard of shadchanim in the non Chasidic world until the 1970's. Do you mean the yeshiva boys from RJJ or MTJ spending summer in the Rockaways on the beach ?" LoM: "The Chazon Ish never really got too old and he took hakhel very seriously. Seriously לאיסור that is." 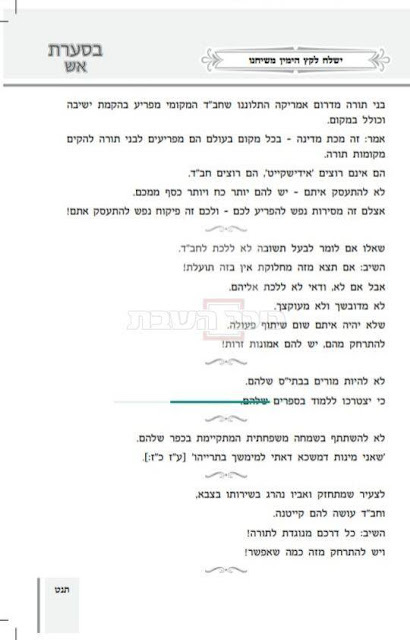 הגרתי בוילמסבורג מתחילת תש"י עד תשי"ד רוב "חרידי" העיר וגם המשתייכים לתורה ודעת לא עשה סוכה בבתיהם כלל, ואוכל לומר בברור שאף אחד מהם לא היה ישינים בסוכה. קשוט עצמיכם!" Williamsburg is a densely populated area with many apartment buildings, many people didn't/don't have their own houses/space for private sukkahs. Instead, they use/d communal Sukkahs, or shared with others. You went around inspecting all the Sukkahs, that you know that no one slept in one? והדברים עתיקים. Demonstrators Call for Banning of Chabad in Russia! Berel Lazar, denied the demonstrators claims that they were only opposed to Chabad, rather than Jews as a whole. “The attempt to present Chabad as one thing and the Jewish community as another is false,” Gorin was quoted as saying by JTA. Your tone in this entry past nisht . "In Dzhikov one did NOT sleep in theSukkah. If somebody happened to DOZE OFF in the Sukkah he would be awakened, so that he not transgress... They would wake him by saying: "Nu, Sukkah..."
As a child I did clime up once the old SR's sukkah on clymer st and peeked into.. (the next year the sukkah got moved to the first floor). "The Lubavitchers’ representation as the poster children of Hasidism in America and worldwide is a gross misrepresentation. Many other Hasidic groups shun Chabad as a separate, modernized entity – akin to the Modern Orthodox – and whose chumros (stringencies) are a lot more lax than the bona fide Hasidim. The media-savviness of Chabad and comfortable relationship with secularism exemplifies their worldliness – something the majority of Hasidim are decidedly not, as a consequence of their insularity."